Loving this mod. Can't wait for water shader. Sadly my graphics card is probably crap, and can't run this either. After an update or two, when I try this out, it might now be feasible to actually build a giant sun dial in game. I'm getting very unsmooth shadows. They jitter a lot when i'm moving. This is incredible! Sadly, anything having to do with the GLSL Shaders puts my FPS to crap, this especially. I maxed at about 10 frames, so I won't be using this unless it gets optimized. Here's a quick screenie I took. Are you on 1.1 or 1.0.0? This is beyond amazing. I honestly don't know what to say. Oh shizzle! This look really cool! Plz update to 1.1.0! You took minecraft to the next level! Okay guys, word from daxnitro is that his GLSL Shaders 1.1 update should arrive within the next few days. He's reportedly fixed shadows quite a bit, I'm super excited! 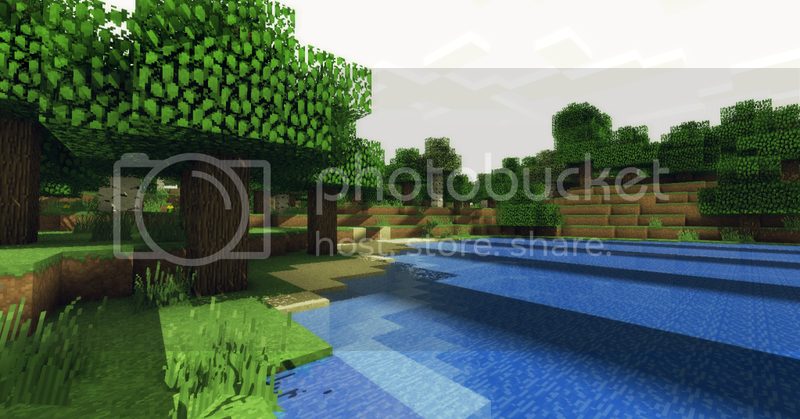 Oh, and those who want to have less blocky and glitchy shadows, refer to the first post and read the Tweaks section. Decreasing SHADOWFOV and increasing SHADOWRES will help a lot. I also did some mindless rambling and brainstorming in hopes of crafting an HDR effect. Great to hear that, sonic! Looking forward to version 1.1. Also, I loved the bloom effect. Haha indeed it's not.. Here's a few tips. Run Minecraft in a tiny window and see if you get significant speedup. If you do, this means that the bloom and SSAO shaders are taking the biggest toll on your rig. Either play at a lower resolution or disable SSAO. Refer to the original post, in the Tweaks section, lower your shadow resolution. And then of course, lowering render distance and using default textures will help as well. Yeah i've already tried that. got 50fps, but makes shadows glitch or jitter. I have a good gaming rig with a 560ti and 12gb ram. Just that GLSL shaders always drops fps really far. Ah, okay. Wow, 12gb, nice! Ram is super cheap right now it's crazy haha. You can also decrease SHADOWFOV for less blocky shadows at the cost of shadow draw distance. Tried it on my laptop, and it handles it pretty well, 45-50fps average. If you could only get it polished more and fix some of the artifacts this will be fantastic! Great mod! !